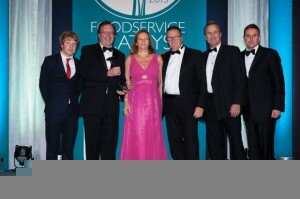 Contract caterer Elior is celebrating a double win following the inaugural Foodservice Catey Awards held at the Park Plaza Hotel, London, last Friday. The award for ‘Healthcare Caterer of the Year’ was presented to Elior’s healthcare development director, Robin Comerford and members of his team thanks to a sound knowledge base and a strategic approach focussing on ‘added value’. Meal time is typically the most important aspect of the day for a resident in a care home. The judges felt that through understanding the needs of the residents they serve, Elior not only enhanced the customer experience, but also boosted its healthcare turnover by 19%. Paul Fisher, Elior’s director of education, was next to collect the prestigious award for ‘Education Caterer of the Year’, beating off some stiff competition in the sector. Business retention, creating a new operational and management team, and sales growth were all key objectives for the business. The judges were impressed to learn that all of these targets were smashed on the way to almost doubling turnover and delivering value for its clients. Elior operates high profile catering contracts across the B&I, health & care homes, defence, education, stadia and heritage sectors. It provides customers with a bespoke offer that focuses on great food, drink and customer service and couples it with the benefits that a large company brings. Elior UK is part of the Elior Group, which operates across Europe with annual revenues of €3.6bn.